Perhaps the most misunderstood aspect of SB Family School is what SB stands for! People usually assume it stands for Santa Barbara. It does; but it also stands for Skona Brittain, Shelly Brittain and Sandy Brittain. About Skona: After obtaining graduate degrees in mathematics (Princeton) and computer science (Penn. ), Skona taught both math and computer science at various colleges. Then she had kids and became involved in homeschooling. Over ten years ago, Skona started coaching math teams in Santa Barbara for her own homeschooled children, and she liked it so much that she's been doing it ever since. At about the same time, she started developing SB Family School's set of Creative Mathematics classes, which she teaches in a variety of venues. 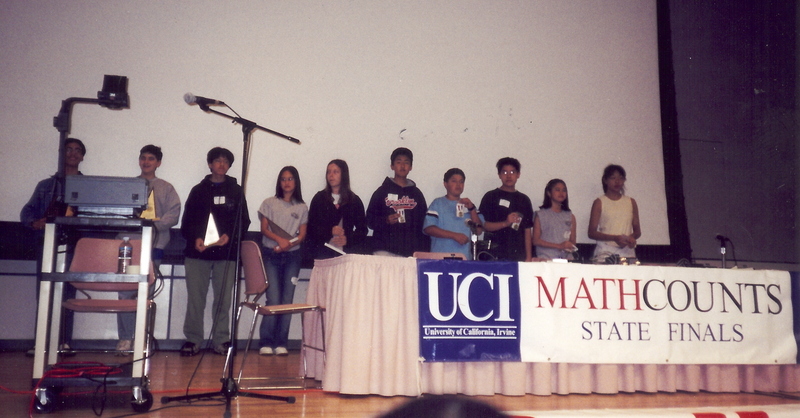 And a few years ago, she helped bring Math Circles to Santa Barbara and has started several different ones. Skona really enjoys facilitating kids enjoying math. In addition to math coaching and teaching, Skona designs and sells unique mathematical and scientific clocks and t-shirts, and works as a freelance copyeditor, specialiing in advanced computer science textbooks. 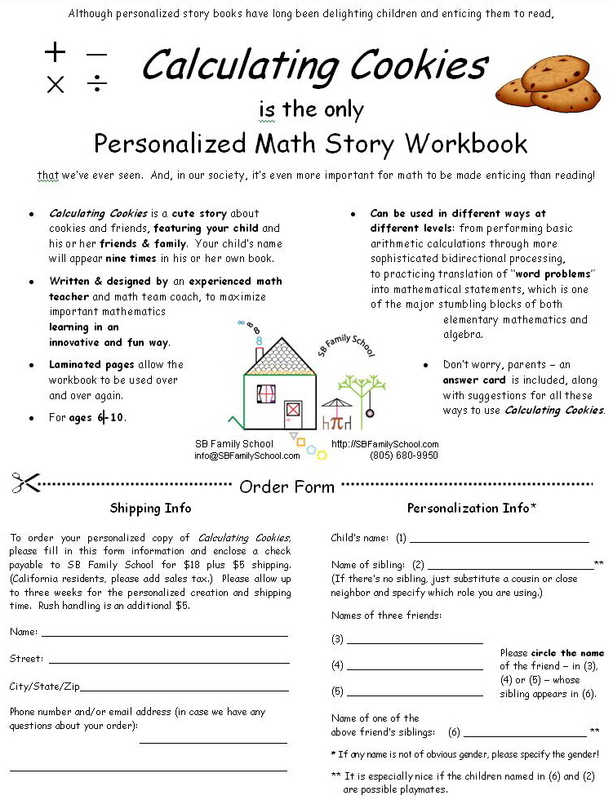 In her spare time, she is writing a physics book (Fizyx for Felines), among other things, and she produces the only personalized math story workbook. Her volunteer work includes coaching a high school ARML team, copyediting for local nonprofit organizations, reading math and science books at Recording for the Blind & Dyslexic, and tutoring math at the Santa Barbara School of Squash. About Shelly: Shelly is Skona's oldest daughter. She was homeschooled for grades 4, 7, 8 and 9. Shelly placed 1st in the Math Super Bowl all 3 years - 4th, 5th & 6th grade. Shelly accepting the Math Super Bowl Award for 1st Place at age 10. In MathCounts, she advanced to the State Competition all 3 years - 6th, 7th & 8th grade, placing 5th, 3rd and 1st at the Regional Competition, respectively. The last year of those years, she placed 5th at the State Competition, higher than anyone else from Santa Barbara County has ever placed, before or since*, and just barely missing advancing to the National Competition. * This record was tied in 2011. The Top Ten Finalists on stage at the State MathCounts Competition. She tied with 17 other kids for #1 in California on the AMC-8 with a perfect score, and on the AMC-12, as an 11th grader, she was #1 at Dos Pueblos High School. As a high school freshman, Shelly worked in the Math Tutoring Lab at Santa Barbara City College. After graduating early from DPHS, she was recruited to a local high-tech company, by an SBFS family. She worked until she moved to Los Angeles, where she now does data management for a travel agency. Shelly is also an award-winning mathematical artist, for her miniature unit origami. She has taught unit origami to both kids and adults. 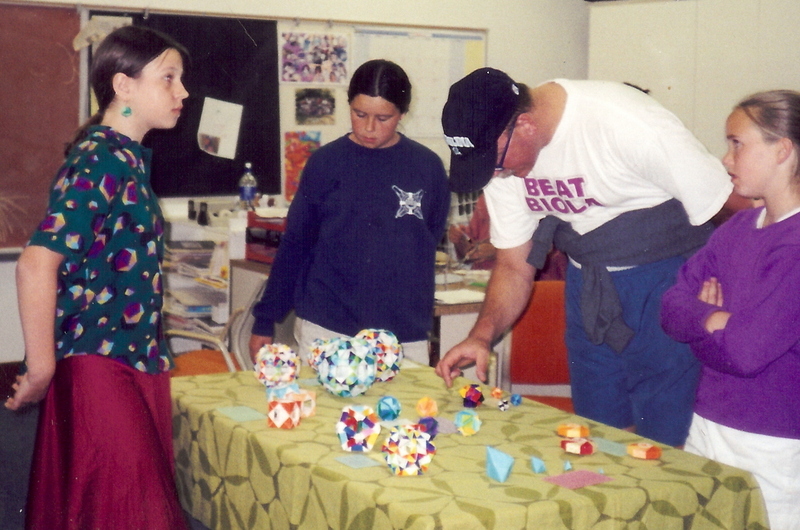 12-year-old Shelly displaying some of her unit origami creations at a homeschoolers fair. About Sandy: Sandy is Skona's youngest daughter. She was homeschooled for grades K,1,2,5,6,7 and 12. She placed 2nd, 3rd and 4th in the Math Super Bowl competition in 4th, 5th & 6th grade, respectively, and was a member of the first SBFS team to win an award. 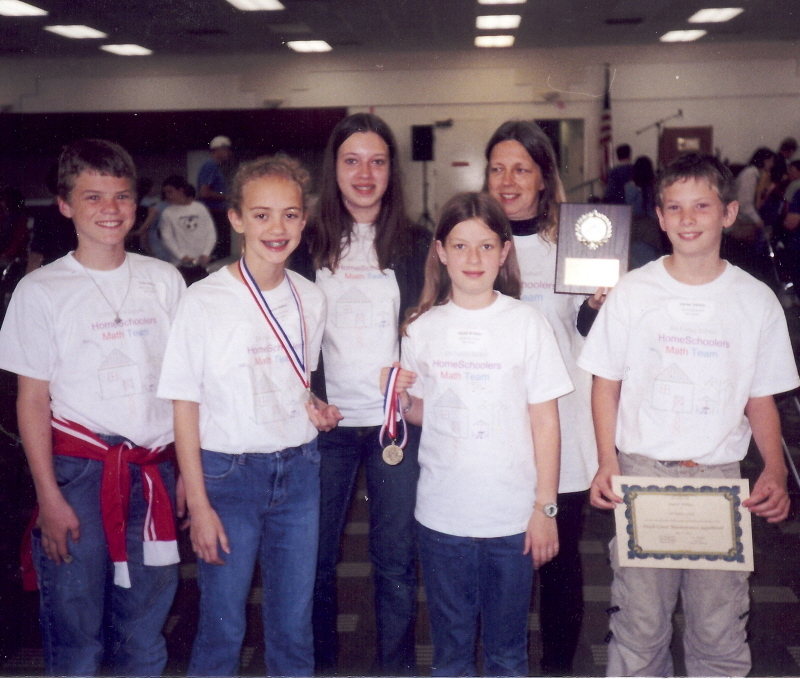 The whole family at the Math Super Bowl with Sandy's award-winning 6th grade team, in our old-style team t-shirts. In MathCounts, she also advanced to the State Competition all 3 years - 6th, 7th & 8th grade, tying for 1st place at the Regional Competition as a 7th grader and tying for 10th place at the State Competition as an 8th grader. Sandy sometimes returns to Regional and State MathCounts competitions as a volunteer in the grading room. In addition to working at the SBCC Math Tutoring Lab and the Digital Arts Center, Sandy has extensive experience tutoring math and computers privately, and has also worked as a freelance website designer. Sandy began programming computers when she was 10 years old, which was years after she started using HTML. In both 2010 & 2011, she was a key member of the team that placed first among junior college teams at the ACM Programming Competition. When she transferred from SBCC to UCSB, she was accepted as a Computer Science Major in the College of Creative Studies. While attending college, Sandy worked as an iPhone App developer at a local health-oriented high-tech start-up. She was recruited by Apple and moved to San Francisco right after graduation to work at Apple headquarters (at 1 Infinite Loop in Cupertino) as a software engineer in the Watch grouo. She's now in the Health group, where she is responsible for several projects on the Watch and iPhone. 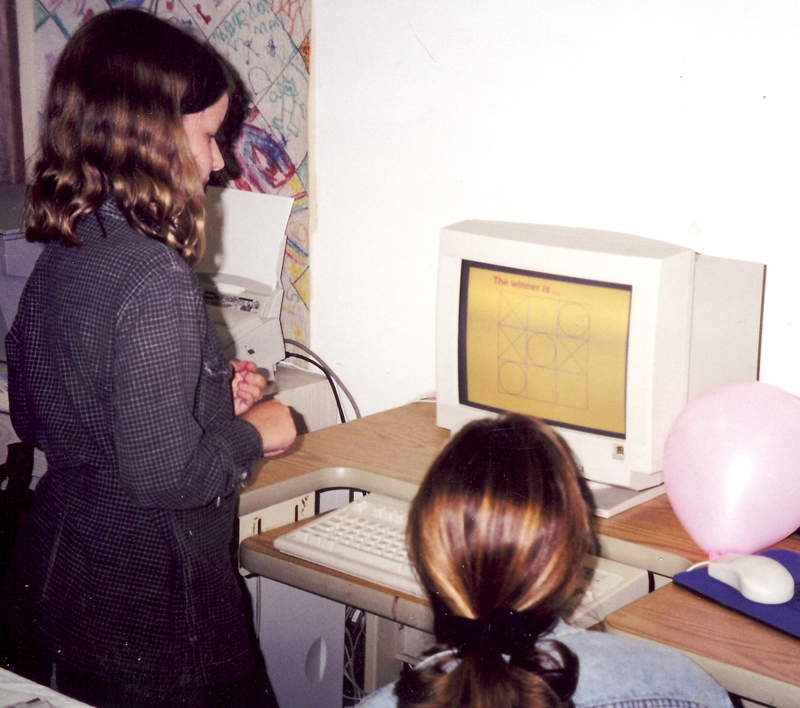 Ten-year-old Sandy demonstrating her first BASIC computer program, which may look like an ordinary tic-tac-toe game but is actually tic-tac-toe on a torus.